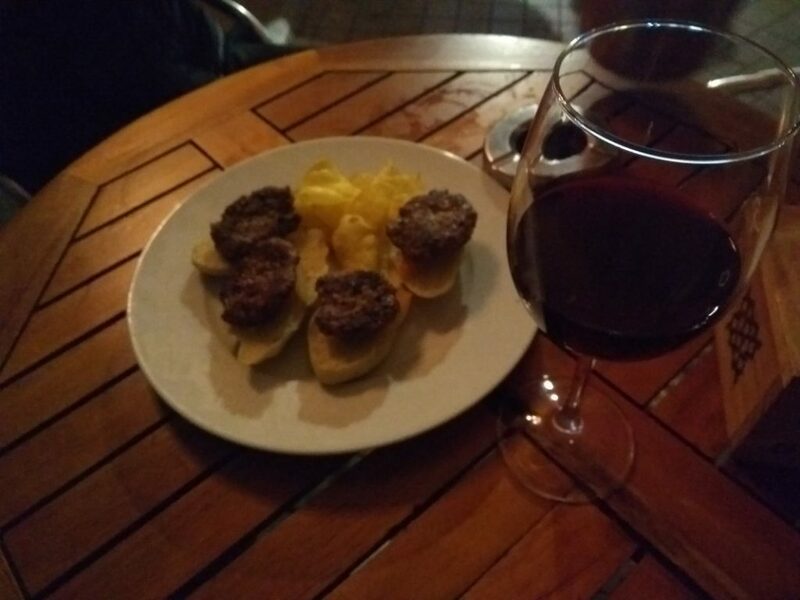 Granada's Tapas Aren't Free (but they may have perfected the system) | Ellen Says Hola! Let’s get one thing straight. If you’re thinking of tapas as food that arrives with booze, then all tapas are “free”. It’s just that Granada is on top of its marketing game. 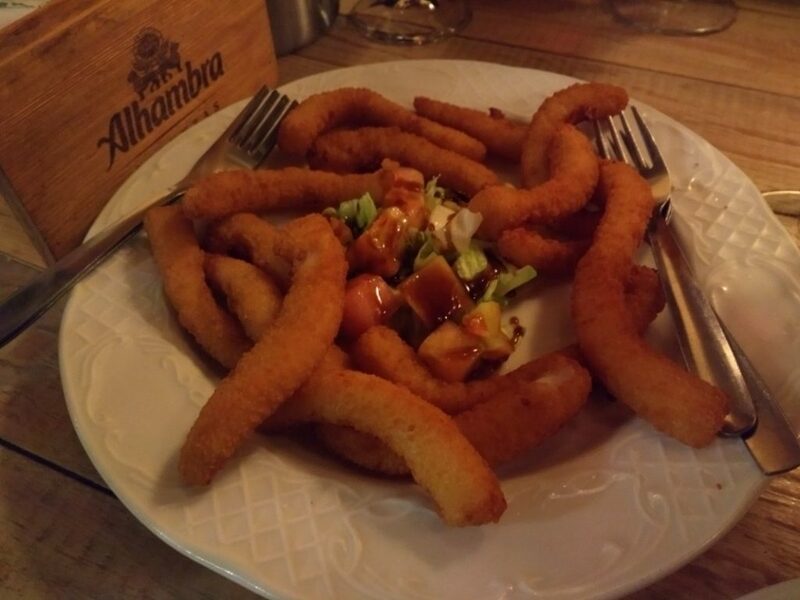 You can get tapas darn-near everywhere in Spain. What I’ve discovered is, Granada has a system. A better system. A delicious system. In previous tapas bars, I’ve selected my drink and chosen a tapa. Some places base the price off of how big/fancy the food portion is. Seems fair. Until you get to Granada. 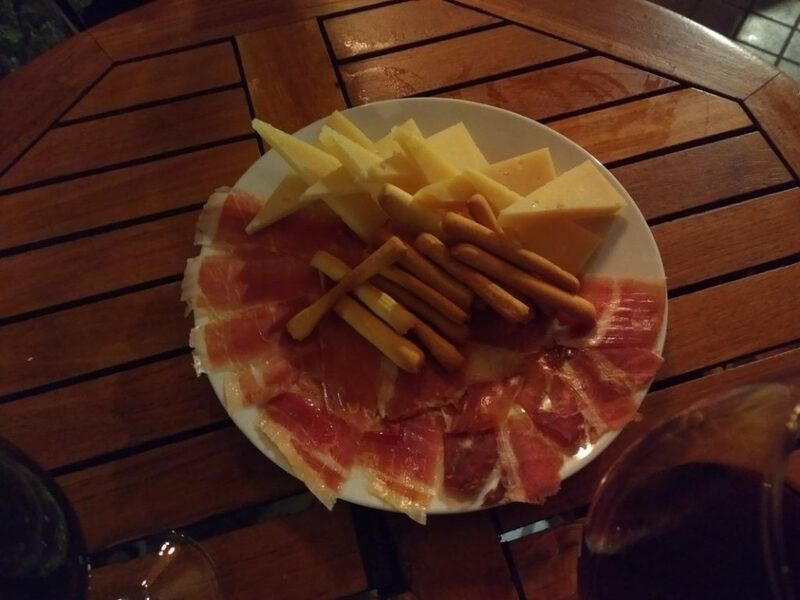 In Granada, you order your drink, and then the tapas bar decides your food for you. In this aspect I’ll grant that it definitely has more of a “buy a drink and we’ll give you food” feel than other cities. We found a wonderful, welcoming tapas bar, Tocateja, and set out to figure this whole thing out. Round One. I attempt to order “tapas” for the group. 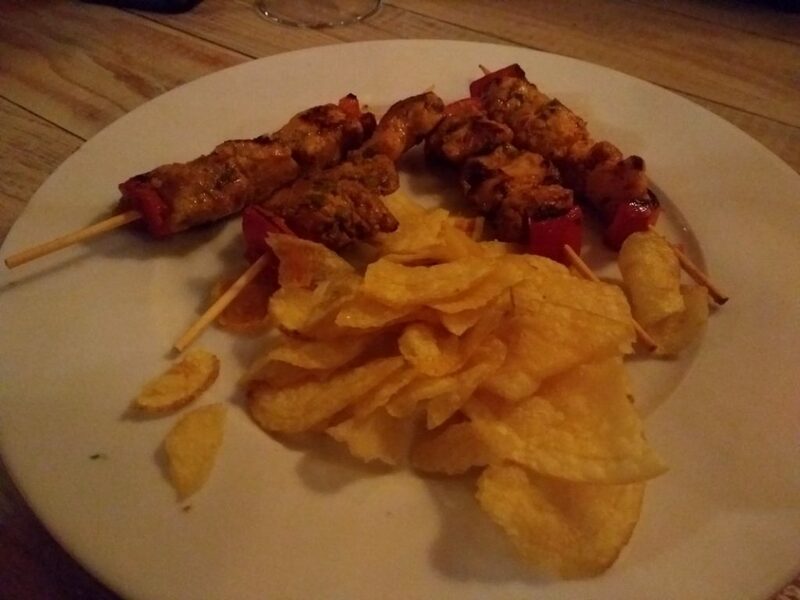 The bartender gently smiled back, explaining you don’t order tapas. You order drinks. Just minutes later, the bartender deposits four burger/sliders on our table, with perfect home-made potato chips (arguably the crispiest, flakiest, perfect-crunchiest crisps in the whole damn world). I remember my lesson from round one, and simply ask for our next drinks at the bar. Señor Bartender, pleased with my progress I’m sure, hands me the drinks. I take them back to our table and again within minutes a new dish is delivered, this time it’s delicious fried seafoody stuff. YUM. By now we’re sensing there’s a pattern. We’ve seen other tables with the burgers, and a few others with the seafood. But.. how is this being decided?? We find out. The server behind the bar has changed, though he is just as happy to fulfill the next “drinks order” (*wink! * I’m on to you, Granada). But then! He has to ask: What was the last dish we had? THUS CRACKING THE CODE. They’re not choosing willy-nilly. These tapas are served in order, by course. As long as the server keeps track, he can ask the kitchen for the next set of tapas, for the right amount of people. Ta-freakin-da. Round Four was “Russian Salad” (ensalada rusa). 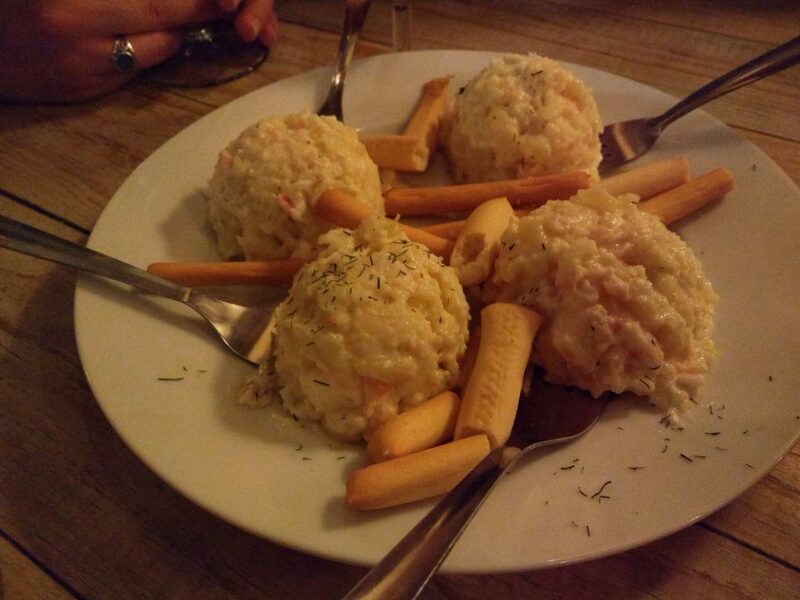 It’s an odd dish for Americans, a mix of potatoes, mayonnaise, shrimp, and sometimes other vegetables. I’ll only say… it’s not something I crave when I’m away from Spain. But this was the best version I’ve tasted, so well done, Tocateja. 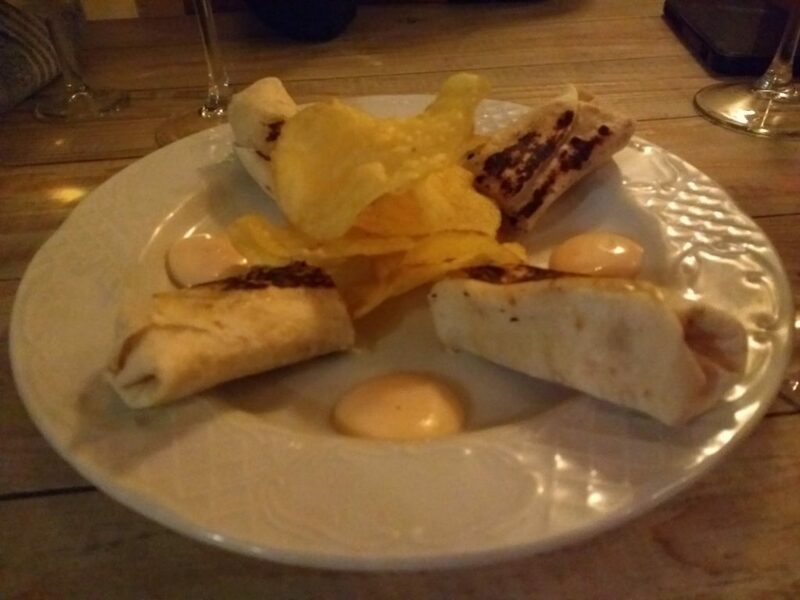 The bartender asked the kitchen to make something up, and we were eventually served … fajitas! And we, in our infinite touristy, foodie glee, asked what was in them (they were delicious, so juicy and flavorful!). The bartender didn’t know (because the kitchen had made it up) so he brought out the chef for us. Apparently the fajitas were filled with “chicken, peppers… and things that go in a fajita,” — the explanation of which was delivered with a very confused facial expression. Until then, Granada. Until then. 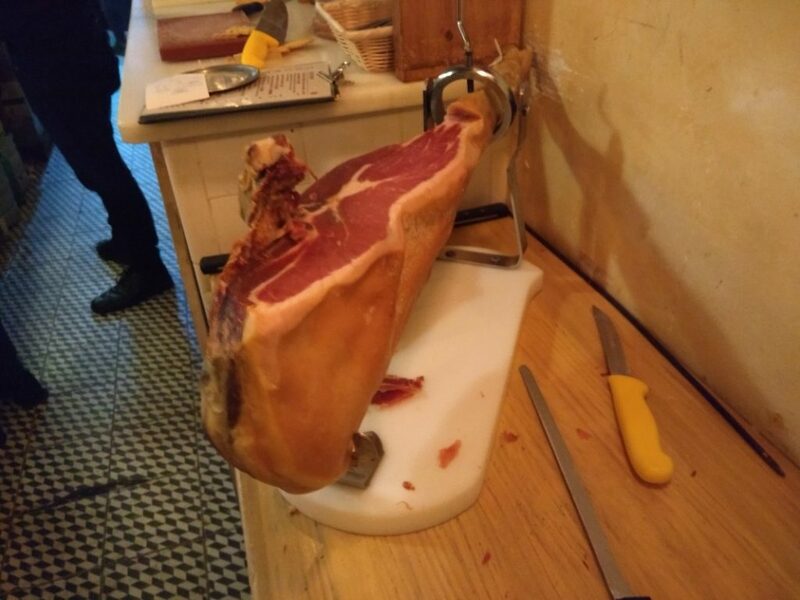 They have their own version of jamon Ibérico, which is incredibly delicious sliced ham.They slice it fresh off the cured leg. And then also some cheese that’s similar to parmesan (but I’m sure has it’s own Spanish name that I didn’t ask about). OM NOM NOM. Congratulations on making it to Round #5! They should put your photo on a wall! Hahaha, they should put our photo up!! <3 Love you, too! Not sure this system would work for me as (a) I can be a bit of a picky eater, and (b) I’m allergic to prawns which often feature quite heavily in tapas… that could go badly for me!